Tom Cruise‘s “Jack Reacher: Never Go Back” battled its way past a crowded field to top the Thursday night box office, taking in $1.3 million in previews. 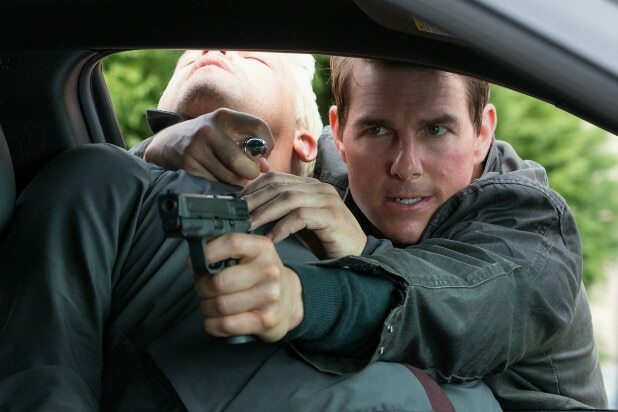 The movie from Paramount and Skydance is a follow-up to “Jack Reacher,” which opened to just $15 million in December 2012, but went on to make $218 million worldwide. “Jack Reacher: Never Go Back” is expected to bring in up to $23 million across 3,780 theaters, which should be enough to carry the film to the top spot this weekend, despite its subpar reviews — the movie has a 37 percent rating on critic aggregator site Rotten Tomatoes. Paramount has a more conservative estimate in the high teens for the movie, which has a production budget of $60 million. With Halloween just around the corner, it’s not surprising that horror is the genre responsible for the next two films on the Thursday box office charts. Tyler Perry‘s “Boo! A Madea Halloween,” a horror-comedy from Lionsgate starring Perry as the title character, placed second Thursday night. The latest in Perry’s popular Madea franchise scared up $855,000 from screenings at around 1,800 locations on Thursday. While it’s only playing on 2,260 screens when it opens wider on Friday — more than 1,500 fewer than “Jack Reacher” — Perry’s “Madea” franchise is a proven draw, and “Boo!” could top out north of $20 million. Lionsgate, however, is going with a more conservative mid-teens projection. Bella Thorne also stars in the film, which has a 25 percent Rotten Tomatoes score. “Ouija: Origin of Evil” from Universal, Blumhouse, Platinum Dunes and Hasbro came in third, bringing in $722,000 in from Thursday night shows at 2,371 theaters. The film, a sequel to 2014’s “Ouija” — itself based on the iconic Hasbro board game — could reel in as much as $19 million this weekend, playing on 3,164 screens. And unlike “Ouija,” which was panned by critics, “Origin of Evil,” which stars Elizabeth Reaser and Annalise Basso, has a very solid 81 percent Rotten Tomatoes score. The first “Ouija” was a huge windfall for Universal, taking in $104 million worldwide on a $5 million budget, and “Origin of Evil” was made for just $9 million. The fourth and final new wide release this week is Fox’s “Keeping Up with the Joneses,” about a suburban couple caught up in an international spy plot. The comedy, which stars Gal Gadot, Isla Fisher, Zach Galifianakis, Jon Hamm and Patton Oswalt, took in $300,000 from Thursday night showings across approximately 2,400 screens. “Keeping Up with the Joneses” hasn’t been favorably regarded by critics — it holds an abysmal 16 percent Rotten Tomatoes score — and is expected to place fifth this weekend with $8 million, trailing the three other newcomers and one holdover from last week, Warner Bros.’ Ben Affleck action thriller “The Accountant.” The movie will play on 3,022 screens.